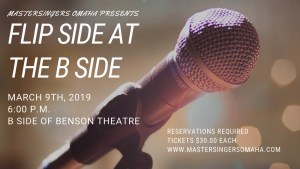 BENSON – The Benson Theatre Project (BTP) is pleased to host MasterSingers Omaha Saturday, March 9, for Flip Side at B Side. The event, an evening of music in a cabaret setting, begins at 6:00pm at 6508 Maple Street. Members of MasterSingers Omaha will perform a variety of hit songs from your favorite artists and shows. The event is billed as a way to “enjoy old favorites in a whole new way during this topsy-turvy night of entertainment.” Reservations are required, as seating is limited. A full bar is available. Tickets for the March 9 performance are $30 per person and include a buffet of appetizers/desserts and a drink ticket. This is a 21 and over event. All proceeds directly support MasterSingers Omaha. To purchase tickets or for more information, visit www.mastersingersomaha.com. For more information, email mastersingersomaha@gmail.com. MasterSingers Omaha is a Benson Theatre Project Community Partner. For more information on how to become a community partner, email info@bensontheatre.org.